Spacious, comfortable award-winning accommodation located in the Chiltern Hills village of Flackwell Heath, 2 miles east of High Wycombe. 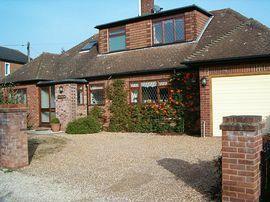 Excellent access to local motorways M40, M25, M4 and Heathrow Airport just 35 minutes drive. Well placed for the business traveller for local business parks - High Wycombe Cressex, Marlow Globe Park, Slough Trading Estate and Loudwater, Wooburn Green and Bourne End. Nearby are local tourist attractions including Legoland, Windsor Castle and Bekonscot Model Village to name but a few, plus beautiful riverside walks along the River Thames within a couple of miles. Our accommodation is comfortably furnished, spotlessly clean and with all the trimmings to make your stay feel like home from home whether it is one or two nights or one or two weeks. We have three rooms: one single, one double and one twin. All have LCD TV'S with Freeview, tea/coffee making facilities, full set of towels, bathrobes and toiletries. Breakfast consists of a luxury continental style selection including a choice, for example, of poached/scrambled eggs, freshly prepared fruit salad or fruit smoothie, eggs benedict or kippers. A full English breakfast is available at an additional cost although this is included free of charge at the weekend. 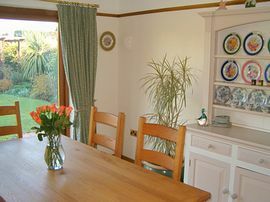 This may be brought to your room at a time convenient for you or taken in the dining room overlooking a delightful garden and where red kites (feathered variety) can be seen swooping and circling the skies above. 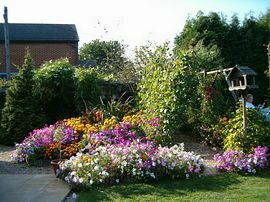 We look forward to welcoming you to Longforgan Bed and Breakfast for a truly English bed and breakfast experience. 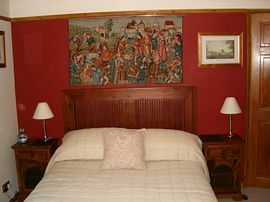 Double Room: £45.00 per night(Single). 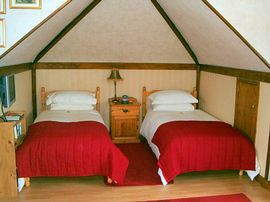 Twin Room: £45.00 per night(Single). All charges are per room and include breakfast. On entering Flackwell Heath village, Magpie Lane is a turning off Heath End Road, opposite the launderette, a single track access only lane. Turn in front of the brick and flint cottage on the corner. Our postcode is HP10 9EA.